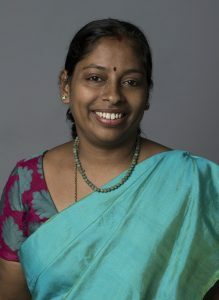 She decided to return to her home base in Madurai with the goal of “giving back to the home soil that had nurtured me.” In Madurai, she joined the Department of Chemistry at Lady Doak College. 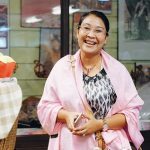 “Lady Doak College is a place for people who are passionate about teaching,” she said, “and who are willing to walk extra miles.” She walked those extra miles as she adopted a “beyond the blackboard” approach to teaching young women. 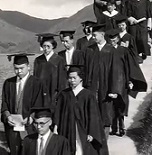 Dr. Sridevi, center, with students at Seoul Women’s University. Dr. Sridevi in her classroom at Lady Doak College. Lady Doak College also emphasizes learning outside the classroom: its Life Frontier Engagement initiative encourages senior-year students to apply their classroom knowledge to social problems. 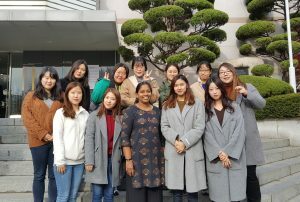 Dr. Sridevi is eager to share this Lady Doak model with faculty from Seoul Women’s University, and a recently signed memorandum of understanding (MOU) between the two institutions opens the door for exchanges on whole person education and other aspects of teaching and learning. “The Fellows Program is meant to create collaboration and community,” Dr. Sridevi said, and through the MOU, ongoing contact with United Board Fellows, and other exchanges, she is expanding the community for whole person education.